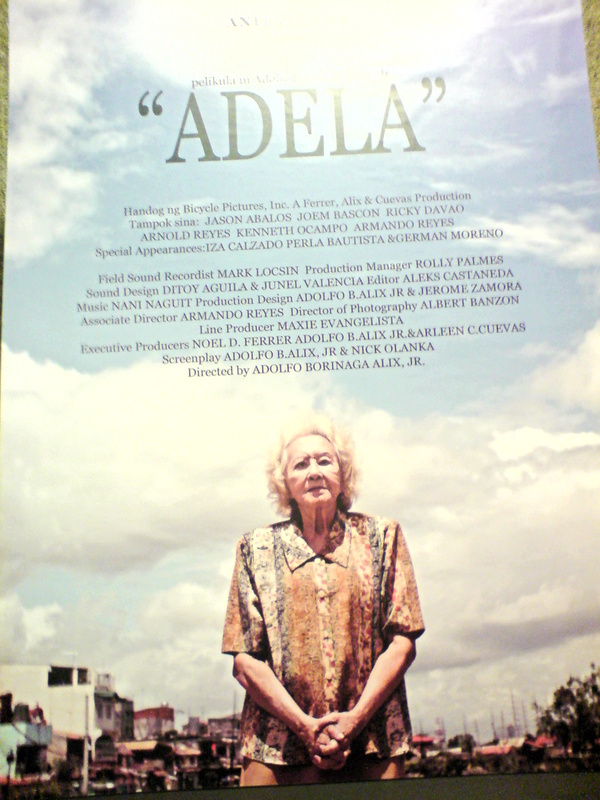 Adela is the first film shown in this year’s CineMalaya 2008. This is directed by Adolfo Borinaga Alix Jr. (Donsol, Kadin) as a tribute to one of the Philippines finest actresses, Anita Linda. Together in this film are Joem Basco, Jason Abalos, Ricky Davao, Arnold Reyes, Kenneth Ocampo, Armado Reyes with special participation of Iza Calzado, German Moreno and Perla Bautista. Adela is a narrative story about an old lady and the things happening around the day of her 80th birthday. The film started with a pregnant woman crossing the highway. As she goes home, she discovered her partner, PJ, is sleeping with a neighbour’s daughter. To her dismay, she accidentally gave birth. Thanks to Adela, a former midwife and radio voice talent, the baby is in good condition. For Adela this is a special day coz she is celebrating her 80th birthday. She is expecting her daughter to come along with her grand children. Also in this day, PJ invited Aling Adela for a gathering to celebrate the birth of his baby and the same time the barangay captain also is convincing her to join the prayer rally for PGMA. As she prepares to go to church, here comes Joem to sell some stolen appliance to Adela. She then gave way and bough the cellphone charger and toaster for P300. She then discovered her wedding ring was gone. She went to a junk shop manager and found out that the appliances her bought are stolen from the oung snacher’s mother. She confronted the young snatcher and pleaded for her ring back but he won’t simply admit it. She simply went to church to pray and give thanks for this special day but she then saw the young snatchers activities. She also met her former co-league in the radio. There were chit-chats and Adela refuses to discuss how lonely her life is. Near the church, she also bought toys and decorations for her apos. She went also to the local prison to visit her son only to find out that her son is about to be convicted and be transferred in the Muntinglupa. She then decided to attend the PJ’s celebration with all the drinking and karaoke singing. While all the gang is singing “Luha”, she got a call from her daughter. It is unclear but based on the reaction of Adela, her daughter won’t be able to come. She went home, gave some pancit to her neighbour. She also went to the young snatcher’s mother and gave the appliance back only to discover an illicit love affair with a stud. As everyone went to the prayer rally, Adela silently went to the river shore and celebrated 80th birthday with an uncertain hope and much pain. The film ended with a disturbing scene where Adela went to a bush place and leaves the audience hanging what happened. The film has great cinematic shots and lots of interpretations and unspoken dialogs. I love the mix of these elements brilliantly presented in just one day. There are political, moral and financial issues presented in the film which gave the film a relevant and realistic view how hard to live a better life now a days. Acting and technical aspects were superb. The only comment I can make is that there are a lot of dead shots which ultimately consumes most on the movie playtime. I like how the story progressed and allowing the audience to wonder about the ending. Honestly I don’t know if Adela committed suicide, went home or leave the place. Maybe I should contact the director and ask him what happened… so Sir Adolf please enlightened us if ever you came and looked at this post. Please give us further discussion on about this film. I was just ashamed to ask you after the show. I was just overwhelmed I guess because I’m just a nobody shaking hands to an accomplished indie director. Here is the shot I got after the film. 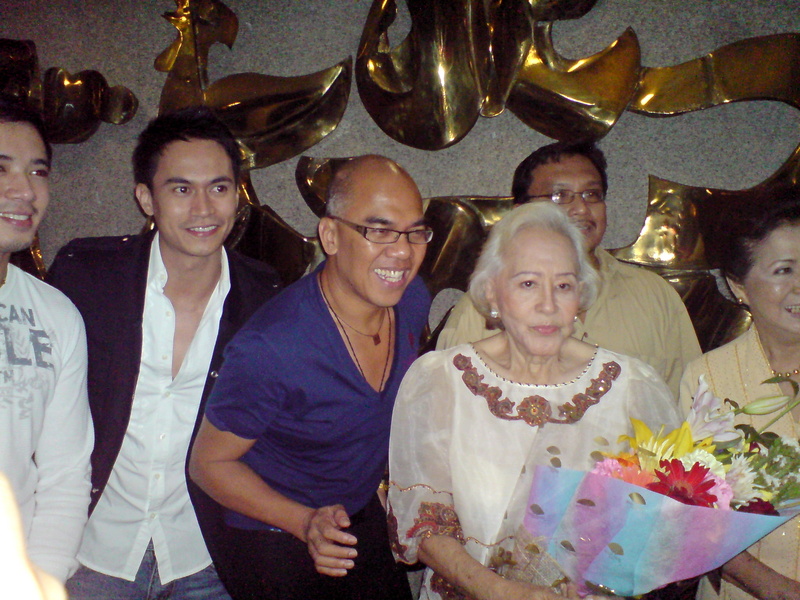 Seen here are Eric Santos, Boy Abunda, Anita Linda and Pearla Bautista. Sorry for the other guy actor, I now sure his name is. With all the elements considered, I will give this film 4 out of 5 Jupiter Star power.